Beautiful Equestrian Ranchette for sale just north of El Dorado Springs and southwest of Osceola in St Clair County, MIssouri. This quiet, secluded location leads to miles of graveled roads that can be used for trail rides. In addition, there is 1,000s of public land acres surrounding Truman Lake and Stockton Lake for additional riding use. 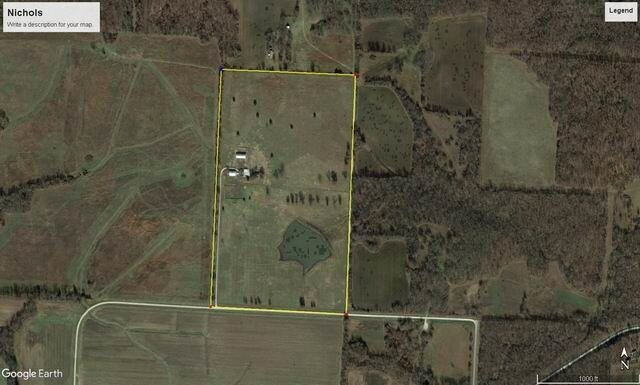 The farm is ~70 Acres of mostly open pasture with a 4 acre lake accenting the property. The outbuilding improvements consists of a 44'x90' bard; a 40'x60' horse barn with 12'x20' tack room & some box stalls with individual doors leading to pasture; and a 24'x30', 2-car detached garage. Additional property improvements includes: fencing and cross-fencing, heated waterer, corral, large training pen, exercise pen, in-ground storm shelter, and more! The residence is a 1996 manufactured home, with 1,716 sq ft consisting of 2 living areas, 3 bedrooms, 2 bathrooms, and 2 decks, nestled in a shaded location. If you like hunting, Linscomb Conservation Area, Truman Lake, and Schell Osage Conservation Area are within minutes of this property. The only thing this farm needs is YOU as the new owner.